With nine home runs through 31 games and 20 walks, Montana junior Delene Colburn, who was named the Big Sky Conference Player of the Week on Wednesday, is on pace for record totals in both categories. And while Colburn relies on a perfect swing and the latter on a bat that remains shouldered, don’t think that the two are not related. “Her first two years Delene had really good seasons,” said UM coach Jamie Pinkerton, whose three-year starting shortstop had 10 home runs and 15 walks as a freshman, 12 home runs and 20 walks last year, while hitting better than .340 both seasons. Colburn earned Big Sky Player of the Week honors for the second time in her career for her performance over six games last weekend at the Grizzly Classic as Montana played its first home games of the season. Colburn batted .438, drove in 12 runs and scored seven times as Montana went 5-1, with a 3-0 record against Seattle and 2-1 mark against Maine, the preseason America East Conference favorites. In Saturday’s 12-4 win over Seattle, Colburn went 3 for 3, with a career-high six RBIs and three runs scored. Her six runs batted in were one off the program record. She had a two-run double in the first against the Redhawks, a three-run blast in the fourth that reportedly landed near Frenchtown and an RBI double in the sixth. She wasn’t done tormenting the school located 30 minutes from her hometown of Auburn, Wash.
A day later, after Seattle had built a 5-0 lead in the fifth inning and took a 6-2 lead into the bottom of the seventh, Colburn came up with the bases loaded. She went opposite field, placing one down the right-field line that allowed Colburn to record a rare inside-the-park grand slam. Montana would go on to win in nine innings. Colburn, who went 3 for 5 with two more home runs in Tuesday’s split with Boise State, numbers that will go toward repeating as Player of the Week next Wednesday, leads the Big Sky Conference in home runs (9), runs batted in (30), total bases (72) and slugging percentage (.809). She is batting .393, which ranks second on the team behind Bethany Olea‘s .404 and fifth in the Big Sky, and has struck out just five times in 89 at-bats. “She’s on a hot streak right now. She is seeing the ball, being patient and working counts, and when you do that, you’re going to be successful,” said Pinkerton. What gets overlooked in player of the week awards is defense, but without sabermetrics or ultimate zone ratings to quantify what’s being done in the field, offensive numbers win the day (and awards). Colburn excels in both. She has the numbers at the plate but also has good range at shortstop, a fantastic glove and arm, and balances athleticism with a physical approach to knocking down balls, casually taking hard-hit grounders into her body, willing to trade a post-game bruise for an out. She makes what would be a web gem for a lesser player look routine and is a big reason Montana has a Big Sky-leading .968 fielding percentage. 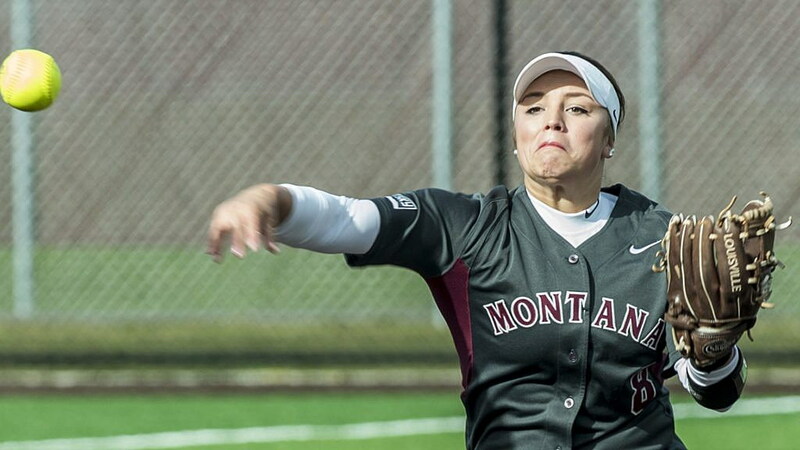 Beyond Colburn’s maturity at the plate for her improved numbers is a statistic that is easy to overlook: Montana’s 3.98 ERA, which is a big drop from the 5.26 the program’s pitchers posted last season. The team’s hitters know they don’t need to carry a heavy load if the Grizzlies are going to be successful. On Tuesday, Maddy Stensby and Michaela Hood held Boise State, the nation’s seventh-ranked offense in terms of team batting average, to five runs over 14 innings. Montana’s six runs in the two games should have been enough to complete a two-game sweep. “You can’t overlook the drop in ERA,” said Pinkerton. “We’ve had a dip in our team’s offensive production this season, but we’re still scoring enough to win ball games. Colburn and her teammates will open Big Sky play this weekend with a three-game series against North Dakota. Saturday’s doubleheader starts at 1 p.m., Sunday’s final game also begins at 1 p.m.